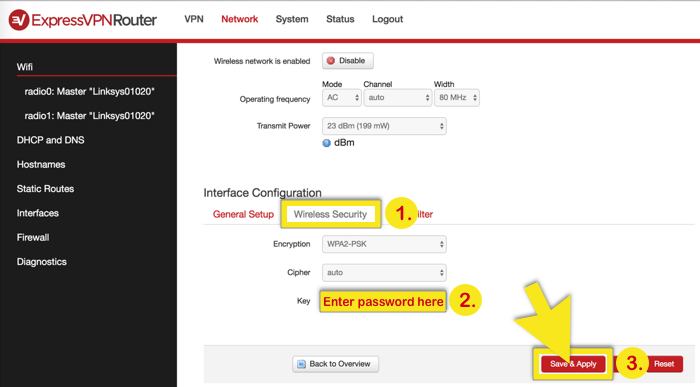 This guide shows you how to change settings on your OpenWRT ExpressVPN Router App. 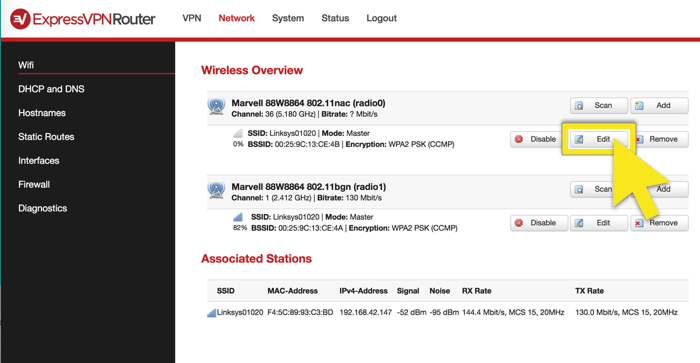 Important: Make sure you’re using the ExpressVPN OpenWRT router app. 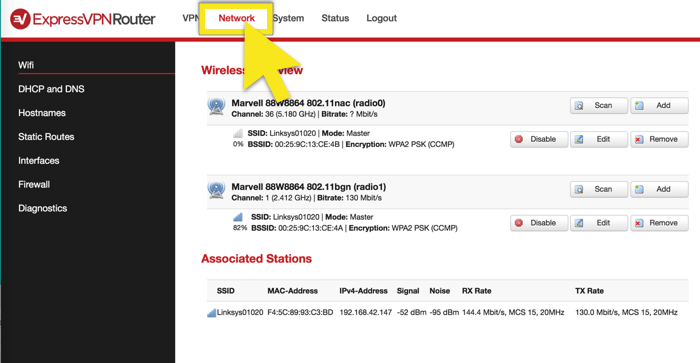 After signing into www.expressvpnrouter.com, you should see VPN, Network, System, Status, and Logout in the top menu bar. If not, follow the DD-WRT router app instructions. Click Network along the top menu. You will see that, by default, both networks have the same name. This allows the device to pick the”better” connection. Select the network you would like to edit and click Edit. 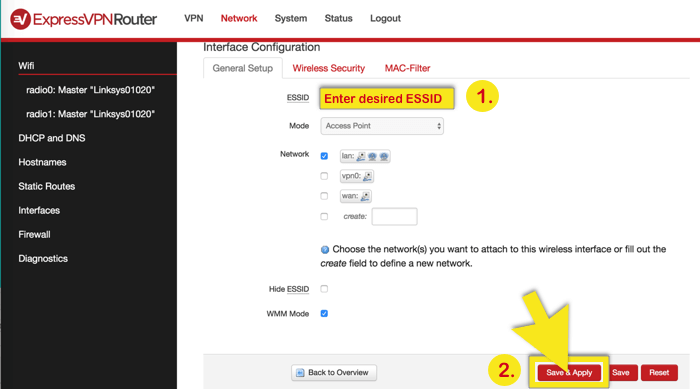 Scroll down to Interface Configuration and input the desired ESSID. Finally, click Save & Apply. Click Network along the top menu. Select the network you want to hide and click Edit. Scroll down to Interface Configuration and check the box next to Hide ESSID. Finally, click Save & Apply. Select the network you want to change the password for and click Edit. Click on the Wireless Security tab and change the password (labeled Key). Finally, click Save & Apply. Click on System along the top menu. Under Router Password, enter and confirm your new password. Click Save & Apply before exiting. Sometimes, you may need to reset your router. If you can access the expressvpnrouter.com interface, perform the soft reset. 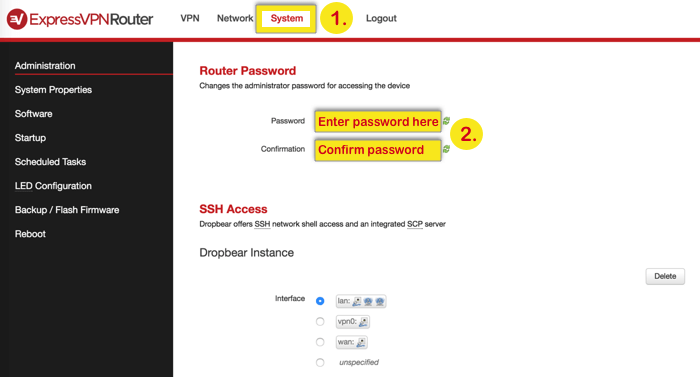 If you cannot access the expressvpnrouter.com interface or the soft reset does not work, perform the hard reset. Click on VPN along the top menu. 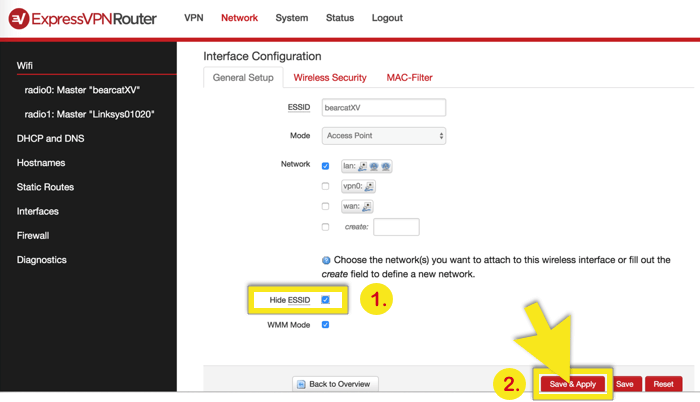 In the side bar, click ExpressVPN Help & Support, and then click Reset Factory Settings. When asked to confirm, click Reset to factory defaults. Press and hold the router reset button (located on the back of the router) for 10 seconds.